A son of Shiva and Parvati, Ganesha is one of the most popular of Hindu deities. Known as the Lord of New Beginnings, offerings are presented to him at the start of any new venture or journey. He is also the god of wisdom and learning, the bestower of wealth and the remover of obstacles. This statue is a fine example of Orissan bronze-casting. The elephant-headed god sits on a lotus throne and in his four hands he is holding an elephant-goad, a cobra, a bowl of cakes, and one of his tusks, which is always shown broken off. His vahana, a mouse, is sitting on the base of the statue looking up at Ganesha. There are several myths surrounding the reason that Ganesha has an elephant’s head on a child-like body. One of these says that Shiva was away when Ganesha was born and on returning to find a male youth at his house with his wife, he cut off the youth’s head. When Parvati told him who the boy was, Shiva offered to bring him back to life. He asked one of his servants to go out and bring back the head of the first thing he met, which turned out to be an elephant. Presented by Douglas and Mary Barrett, 1980. Chubby elephant-headed Hindu deity and son of Shiva and Parvati. He is the god of wisdom, bestower of wealth, and remover of obstacles who is invoked at the beginning of any enterprise. Like the previous figure [EA1966.88], this bronze attests to the continuing high quality of work produced in Orissa at a relatively late date. There are indeed striking similarities with the stone image, as in the imaginative treatment of the hair (a wig?) which sits on top of Gaṇeśa’s head. Unquestionably made of hair, it resembles at the same time the multi-layered roofs of many of the temple buildings in Orissa. Gaṇeśa, according to the Purāṇas, is the son of Śiva and Pārvatī, although his relationship with his mother is particularly close. One of the most popular of all the Indian deities, he is the god of wisdom and learning, the bestower of wealth and above all the remover of obstacles (Vighneśvara). As such he is worshipped before any new undertaking, and at the beginning of all religious observances except funeral rites. Accounts differ as to how he got his elephant head and why one of his tusks is always shown broken off. The elephant-headed god sits in a rare position [see EAMd.13] on a lotus-petalled throne, with his vehicle, a mouse (or shrew) on the base looking up at him. In his right upper hand he holds the elephant goad (aṅkuśa), in the left a hooded serpent. His sacred thread (yajñnopavīta) is likewise a serpent which indicates his connection with Śiva. His lower left hand holds a bowl full to the brim with little round cakes, of which Gaṇeśa is believed to be inordinately fond. The end of his trunk, which is turned to the left, is about to pick up one of the cakes. His lower right hand holds what is almost certainly the end of his broken tusk. 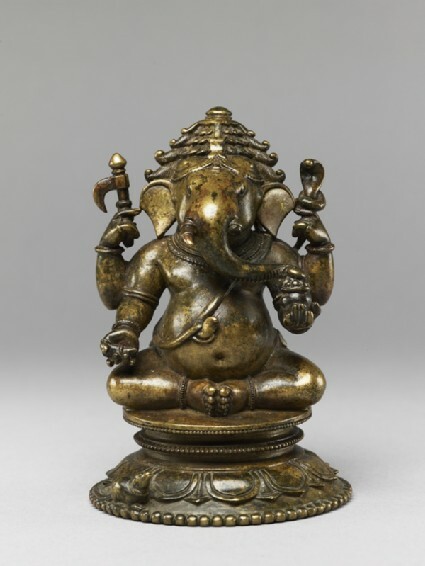 The Ashmolean’s bronze is closely related to the magnificent ivory Gaṇeśa from Orissa, now in the Metropolitan Museum, New York, although smaller and probably a century or two later in date. The bases are similar, as is the shape of the ears, and the elaborate and distinctive dressing of the hair, referred to above, is almost identical in both sculptures. The highly distinctive fashion at the back of the head, where three widely separated tresses diverge and hang down the waist. From the waist band also, on either side of both images, hang heavy tassels of a particularly Orissan shape.